Welcome to Andrea's Ben Grieve Page! I have been a fan of Ben Grieve since the first game he played with the Huntsville Stars, our local team and the Oakland Athletics' AA team through the 1998 baseball season. (The Stars are now affiliated with the Milwaukee Brewers.) He's so talented that he didn't remain here in Huntsville for long, though. What can I say about Ben that hasn't already been said? He's a wonderful baseball player; he's got it all--he's a great hitter, smart baserunner, talented outfielder, I could go on and on. His talent was recently recognized when he won the 1998 AL Rookie of the Year award. "The A's have waited patiently as Grieve worked his way through the farm system. The big lefthanded hitter had his share of successes and struggles through his first three seasons, then energed last year as everything the organization had hoped. He started the season in Double-A Huntsville, made a stop at Triple-A Edmonton and finished in Oakland, where he made quite an impression by hitting .312 in 24 games. At three levels, he combined for .344-34-160 numbers with 106 walks. The A's eventually expect him to become a three-hole hitter who combines power, average, and on-base percentage. He has always seemed unruffled by pressure, and that held true after his promotion to the majors. 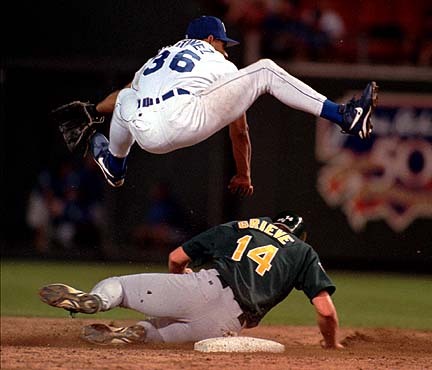 Grieve has been given the right field job, and the A's expect him to emerge as an all-star before very long." Since this page is just now being built, about all that's going to be here at first is a couple of pictures, his bio, and some links to some of my favorite Ben pages. Check back soon, though, because this page will be updated often. In addition, I have some great pictures from the final Oakland/Huntsville exhibition game. I've been busy with school and life in general, but I'll get some of the Ben pics scanned and up here as soon as I can. Ben Grieve fans have been here before you.